The Cape Neddick Mission Bookcase still maintains a mission look but without the through mortise joinery. 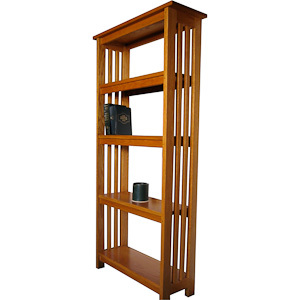 This bookcase still uses the classic mortise and tenon joinery and is every bit as strong, although simpler in design. This bookcase has an open back and can be viewed from either side thereby allowing it to be used as a space divider in a room. All shelves are typically fixed. A no charge option allows one or two adjustable shelves. Please specify when ordering. Note: 2 and 3 shelve units can have 1 shelf adjustable, 4 and 5 shelf models can have 1 or 2 middle shelves adjustable.